Two shields come in each box in either bronze or white powder-coated metal, plus instructions and light pollution information. $25.00 plus $5.00 shipping (plus tax for NYS residents). Bulbs not included. 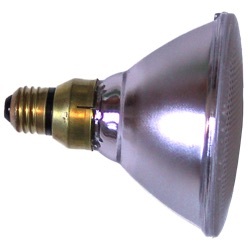 For PAR38 bulbs with metal rim only. We recommend you do not bend the clips of the bronze shields to resize for other PAR38 floods. PayPal is easy, secure, and private. Save energy and the environment at the same time! The Parshield® glare visor fits most outdoor PAR38 style bulbs, which have a 4.75" diameter with a rim as shown on the left. The Parshield® will clip snugly to the 24 watt (120 watt equivalent) PAR 38 LED flood from Home Depot and the Kobi Electric K6L8 15 watt (70-Watt equivalent) PAR 38 LED sold on Amazon. Philips indoor/outdoor PAR38 flood, 90 watt Halogena with part number 816263, from Home Depot. Other retailers might also sell this bulb.